In poetically appropriate fashion, Batman: Return of the Caped Crusaders will have its World Premiere in Gotham itself as Warner Bros. Home Entertainment debuts the full-length animated Batman feature film on Thursday, October 6 at New York Comic Con. Available November 1, 2016 on Blu-ra Combo Pack and DVD, fans will get their first chance to see the film during a two-hour premiere and Panel starting at 5:30 PM on New York Comic Con's Main Stage at the Javits Center. Adam West (Batman) headlines the post-premiere Panel alongside director Rick Morales (LEGO DC Comics Super Heroes - Justice League: Cosmic Clash) and screenwriters Michael Jelenic (Teen Titans Go!) and James Tucker (Justice League vs. Teen Titans). Tucker and Jelenic also serve as Supervising Producer and Producer, respectively, on the film. Warner Bros. Animation President and the film's Executive Producer Sam Register will moderate the festivities. Produced by Warner Bros. 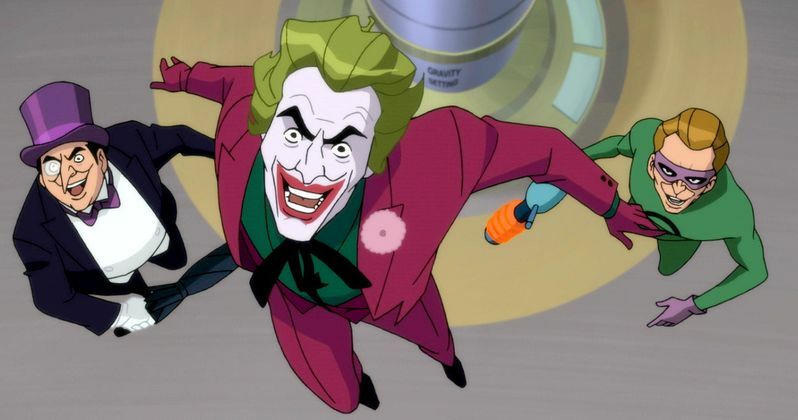 Animation and DC Entertainment, the film takes fans back to the 1960s as Batman and Robin spring into action when Gotham City is threatened by a quartet of Batman's most fiendish foes - Penguin, The Joker, Riddler and Catwoman. The four Super Villains have combined their wicked talents to hatch a plot so nefarious that the Dynamic Duo will need to go to outer space (and back) to foil their arch enemies and restore order in Gotham City. It's a truly fantastic adventure that will pit good against evil, good against good, evil against evil ... and feature two words that exponentially raise the stakes for both sides: Replicator Ray. Holy Multiplication Tables! Batman: Return of the Caped Crusaders will be available to own on Digital HD starting October 11, 2016. Warner Bros. Home Entertainment (WBHE) brings together Warner Bros. Entertainment's home video, digital distribution and interactive entertainment businesses in order to maximize current and next-generation distribution scenarios. An industry leader since its inception, WBHE oversees the global distribution of content through packaged goods (Blu-ray Disc™ and DVD) and digital media in the form of electronic sell-through and video-on-demand via cable, satellite, online and mobile channels, and is a significant developer and publisher for console and online video game titles worldwide. WBHE distributes its product through third party retail partners and licensees. Warner Bros. Animation (WBA) is one of the leading producers of animation in the entertainment industry, producing and developing projects for multiple platforms, both domestically and internationally. WBA's TV series include Be Cool Scooby-Doo!, Bunnicula, Justice League Action, Teen Titans Go!, The Tom and Jerry Show, Wabbit - A Looney Tunes Production for Cartoon Network, Mike Tyson Mysteries for Adult Swim and the forthcoming Green Eggs and Ham for Netflix. As the home of the iconic animated characters from the DC Comics, Hanna-Barbera, MGM and Looney Tunes libraries, WBA also produces highly successful animated films - including the DC Universe Animated Original Movies - for DVD. One of the most-honored animation studios in history, WBA has won six Academy Awards®, 35 Emmy® Awards, the George Foster Peabody Award, an Environmental Media Award, a Parents' Choice Award, the HUMANITAS Prize, two Prism Awards and 20 Annie Awards (honoring excellence in animation). Taking place October 6-9, 2016 at the Javits Center, New York Comic Con is the East Coast's biggest and most exciting popular culture convention. The Show Floor plays host to the latest and greatest in comics, graphic novels, anime, manga, video games, toys, movies and television. The Panels and Autograph Sessions give Fans a chance to interact with their favorite Creators, while screening rooms feature sneak peeks at films and television shows months before they hit big and small screens. New York Comic Con is the second largest pop culture convention in America and the only one that takes place in the comic book, publishing, media and licensing capital of the world - Gotham City.